One of the things I have never liked about their films (Pixar or any other films actually), is their titles to sequels. Toy Story 2? Toy Story 3? Cars 2? Really? I mean, you couldn't come up with something better than that? Thankfully, the new Monsters Inc. 2 film is titled: "Monsters University." Which is actually a first. Naturally it has nothing to do with story, but I've always liked an original name rather than a number. If only that it masks the fact that something is an out-and-out cash grab. Even the sequels to "The Matrix" had titles like "The Matrix Reloaded" and "The Matrix Revolutions." And if any film could logically have a number title it would be one that has to do with a story about being trapped and turned into nothing more than a bunch of numbers in a mechanically engineered world. And it seems even DreamWorks Animation has gotten into the numbers game with "Kung Fu Panda 2," which used to be titled: "Kung Fu Panda-The Kaboom of Doom." While I know Marketing plays a part in this, I don't feel that audiences will be confused with seeing a title connected to a film. After all, most chapters in books tend to have names, like: "The Creeping Fear" or something similar. I tend to think of sequels to films the same way; just another chapter to the story. One of the many bonuses I get with a great film like "The Dark Knight"is its great story along with a great title. They could have called it "Batman 6," but it wasn't. It was the opposite problem I had with the original Superman films. Why did they have to call "Superman 2" that? Why did they have to make 3 and 4? Well, the fourth one had a subtitle, but the problem with that film wasn't the title, but a bad story, script and the clear lack of understanding what or who Superman was. This is why I like the title of the new film: "Man of Steel." It clearly is a story about the last son of Krypton, but also a declaration of narrative simply by naming it that. Don't get me wrong. I'm not saying I'd love to have a great title and a really crappy film. I'm just asking why we can't have both? While I love John Lasseter's attention to detail focusing on the films his Emeryville studio makes, I just have to ask why they can't spend a day or two trying to come up with a title to give it other than a number. I agree with you 110%. I've actually had this same topic of conversation with my boyfriend a number of times. Reminds me of the 80s era when everything was "Something: The Movie" as if you might pay 6.50 to see something else in a theater back then, particularly for animated films (from TV shows - Robotech, GIJoe, Transformers all did this that I can recall without google). Spaceballs, of course, made the most of that. I respect your argument about sequel titles. Personally, It doesn't really bother me when a movie simply has the original film's name & a number for that sequel. Nonetheless, I love how each Harry Potter Book & Film had a distinct title regarding the story told in that installment. I hope that the upcoming Tintin film from Steven Spielberg & Peter Jackson follow the subtitle formula because it would relate the film with Herge's comics. I guess that I'm more for subtitles when it's from a preexisting series with subtitles already given. I could care less about the title. If the movie is good and looks interesting. I'll go see it. I disagree. I like how cut-and-dry the numbering system is. If you look at the boxset for the Rocky movies, for example, you'll see Rocky, Rocky II, Rocky III, Rocky IV, and Rocky V. There's a purity and a symmetry to it. Then they decide to blow it all with Rocky Balboa which just doesn't fit with the other titles. In fact, a lot of franchises dig holes for themselves by straying from the number system. Friday the 13th: The Final Chapter was definitely not the final chapter. Neither was Jason Goes to Hell: The Final Friday. I find that waaay more annoying that helpful little numbers. Look at the Fast and the Furious sequels: 2 Fast 2 Furious, Tokyo Drift, Fast and Furious, Fast Five. It's confusing and dumb. Give me numbers any day. My favorite example of movies using unique titles for sequels rather than numbers are the classic Universal monster movies of the 30s-50s. Frankenstein, Bride of Frankenstein, Son of Frankenstein, Ghost of Frankenstein, etc. The numbering comes from the same marketing weasel logic that turns "Rapunzel" into "Tangled" (but only in the U.S.) because it will better appeal to boys. 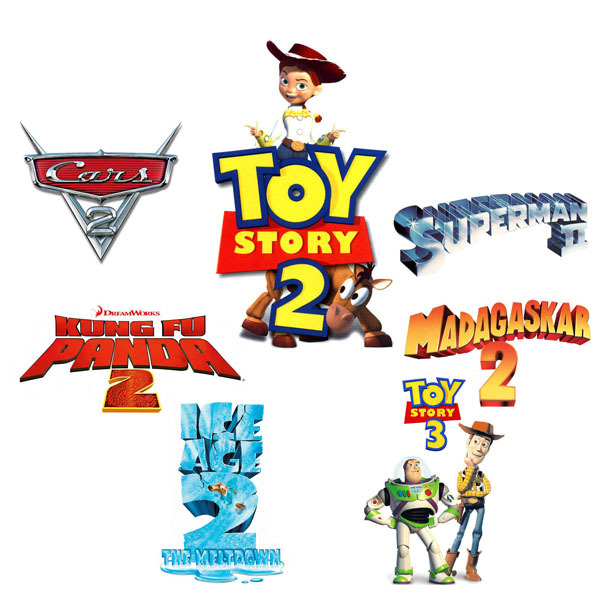 With animated films the predominant big corporate studio marketing logic is that in offering differing titles weakens the larger franchise by confusing the consumer. Unfortunately, they always have some amount of statistical charts and graphs with numbers to back up their points so it's hard for the creative teams to argue that (as an example): "Kung Fu Panda-The Kaboom of Doom" is better because it's "cooler sounding" than "Kung Fu Panda 2" if the weasels are showing that the studio may potentially lose x number of dollars. So it remains the eternal struggle (Walt and brother Roy anyone?) of nickels and dimes vs. creative - whether it's a movie title, or a new ride at the park. Actually, you AGREE. Rocky numbers make sense---bouts of a boxing match. And the fast and furious crap plays with the numbers. You're saying the same things. I am sorry but I disagree with you completely. Subtitles sound incredibly Corney for sequels. Most movies are better off not having subtitles, ala Toy Story 1,2,3. Could you imagine if TS had subtitles. Toy Story: Woody's Wild Adventure. No. Thanks for the thought but no. Where did he say subtitles? He said titles, as in the "title" of this post. Read the whole article before you make up your mind, please. If they would have used the subtitle you mentioned it would have been bad, but some other title with Toy Story in mind could have been cool. You know you make a whole lot sense when you said, having an original title or at least a continuity using words in the original title would make sense. I guess that's why people expect so much more with 'numbered' sequels because they think it will most likely bring about the emotions they felt when they saw the first installment. So true! As soon as I hear "2" "3" etc, I turn off. It makes it a non-event. Like you said they should treat sequel titles like books do... with real titles. So much more enticing. You are absolutely correct about the title. It is all about the title.